The Well-Appointed Catwalk: Vinyl Saarinen Chairs? 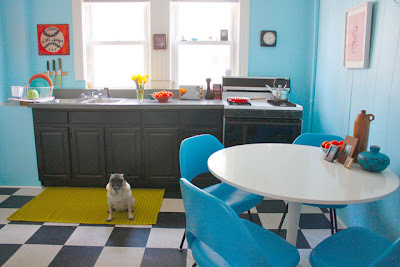 After the adorable pug, the first thing that struck me about this kitchen in Apartment Therapy's "House Tour" of a Jamaica Plain apartment was, obviously, the color palette. Robin's egg blue and gold happen to be a favorite combination of mine when it comes to interior design. But what really made me stop in my tracks was when the apartment-dweller, artist John Guthrie, remarked that these were Saarinen chairs. 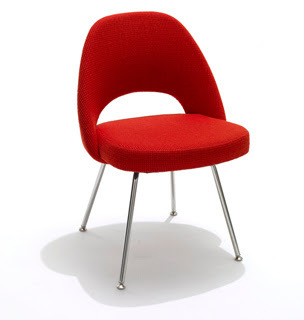 Wow, they are Saarinen Executive Side Chairs, aren't they? Covered in bright turquoise vinyl (all out '50s diner-style), I didn't even notice that these were the famed mid-century classics. Have you ever seen anything so amazing? Perfect for easy clean-up in a kitchen, too.